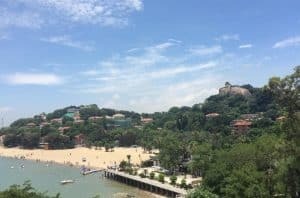 Our 1-day well-designed Xiamen trip is best for tourists at all ages to experience the beauty of the city. .
Sunlight Rock, Birds Garden, Shuzhuang Garden, Piano Museum. After lunch tour to, Nanputuo Temple, Xiamen University, Huan Dao Road, Zeng Cuo an and the Beaches. I will pick you up from your hotel, and transfer to the ferry on a 15 minutes boat trip to Gulang yu islet. Take a peaceful walk and appreciate various ancient architectures and the unique cafes as well as souvenir stores if you are interested. We will then visit Suzhuang garden including the Piano Museum, then Sunlight rock and the beach. You may take some time to enjoy the local food as you prefer. After the lunch we will take a ferry back to Xiamen Island and head to South Nanputou temple, Xiamen University, Huandao Road, Zeng Cuo An and the beaches. Please be noted that, I am an individual tour guide, not a travel agency, nor a company. USD100/per day is just for my services. The price doesn’t include the tickets to the tourist attractions or the transportation as the whole tour is changeable according to customer request. You may want to take public transportation instead of a private car or taxi, or don’t want to visit all of the places that require tickets. About the transportation, taxi is recommended. Private car is not really necessary as Gulangyu island is car-free. Taxi in Xiamen is cheap and convenient; buse can be a good choice too during no-rush hours. But if you require a private car, I can arrange it too. Please contact me with the tourist number and places to go, I will quote accordingly. Please click here some photos of the tourist attractions.